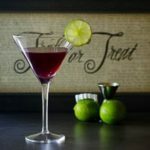 A recipe for Vampire Delight Martini made with pomegranate, blueberry, and lime juices, vodka, and simple syrup. A great cocktail beverage for Halloween. Add pomegranate-blueberry juice, vodka, lime juice, and simple syrup to a cocktail shaker filled with ice. Garnish with a lime slice or wedge if desired.